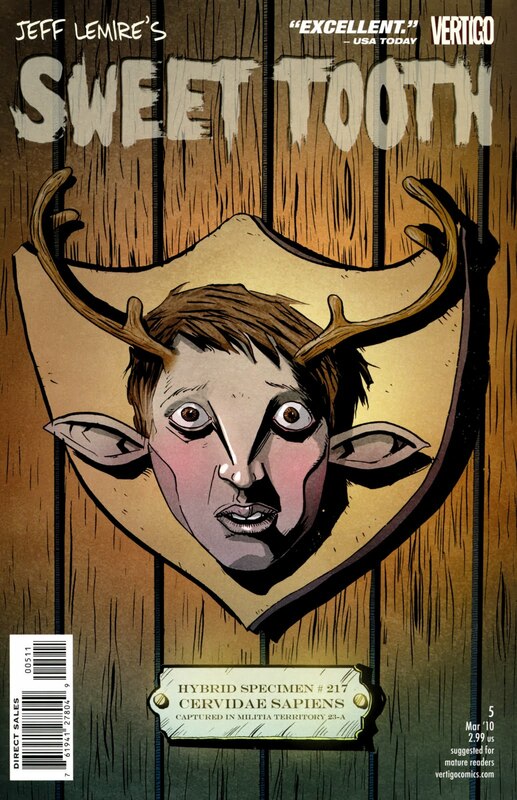 The conclusion to ‘Out of the deep woods’ is as satisfying as every other issue so far. As Jepperd and Gus finally make their way to ‘The Preserve’. There is, in a metaphorical sense, a real feeling that you are reading this from between your fingers, trying to block out the increasing sense of dread. It is a barren and barbaric world, ugly in its callousness, buildings stripped of any beauty or welcome, every turn presenting a threat. Gus & Jepperd do not have an easy journey, and Lemire’s portrayal of a particularly bloody showdown is laid out terrifically. By the end, the excitement and thrill is replaced by horror and shock, but throughout these 20 or so pages there is one constant – the power of Jeff Lemire’s storytelling. An absolute joy to read. Issue 6 may see this title go off on a different riff, we should be seeing new characters (a Doctor Singh who has been mentioned in upcoming solicitations should make an appearance), and see a bigger picture emerge – and maybe where Gus fits into it. A brief dream sequence in this issue may be portentous….